U.S. maritime imports showed little sign of slowing in June with a rise of at least 7% vs. a year earlier. That’s likely been driven by a rush to beat duties that were implemented against Chinese exports on July 6, with imports from China up 13% vs. 3% in May and a decline in April. All the major industries tracked by Panjiva saw rising imports for the first time since February (lunar new year). 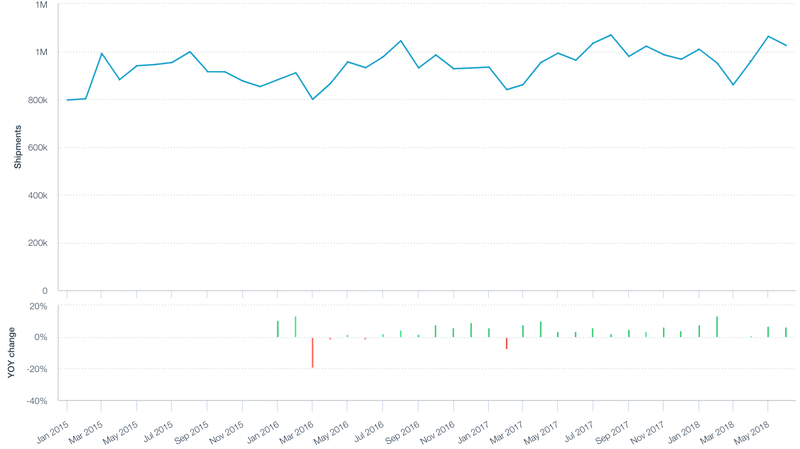 The auto industry’s shipments rose 7% vs. a 2% decline a month earlier, likely due to concerns about an early completion to the section 232 “national security review”. Imports of steel and aluminum increased 6% indicating duties applied in the past two months trimmed rather than transformed supply chains so far. 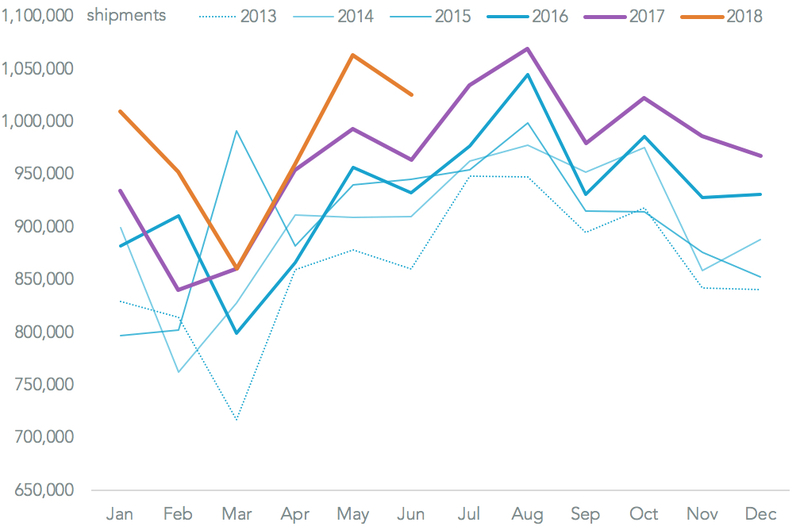 The underlying demand for imports (based on consumer and business confidence measures) remains positive and the year-to-date performance suggests imports could rise 5% for the full year. Yet, with China accounting for 42% of imports the newly implemented tariffs will likely cut that growth rate in the coming months. U.S. maritime imports climbed for a 16th straight month in June on a preliminary basis, Panjiva data shows, after a 6.5% increase vs. a year earlier. That left the second quarter as a whole 4.8% higher and would suggest the early stages of the wide-ranging duties applied by the administration of President Donald Trump haven’t cut imports significantly. Indeed, the threat of duties against Chinese imports from July 6, as outlined in Panjiva research of July 2, may have accelerated the rate of import growth. 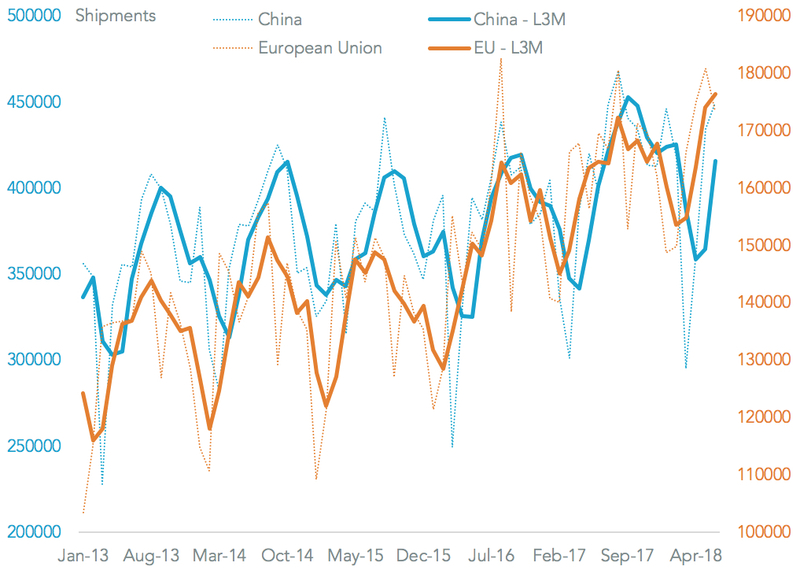 That can be seen in shipments from China that climbed 13.2% (from 3.4% in May and a decline in April) to a level normally associated with peak season deliveries. By contrast imports from the European Union, where there is a war of words rather than tariffs currently, only increased by 2.2% after a 15.6% rise in May. 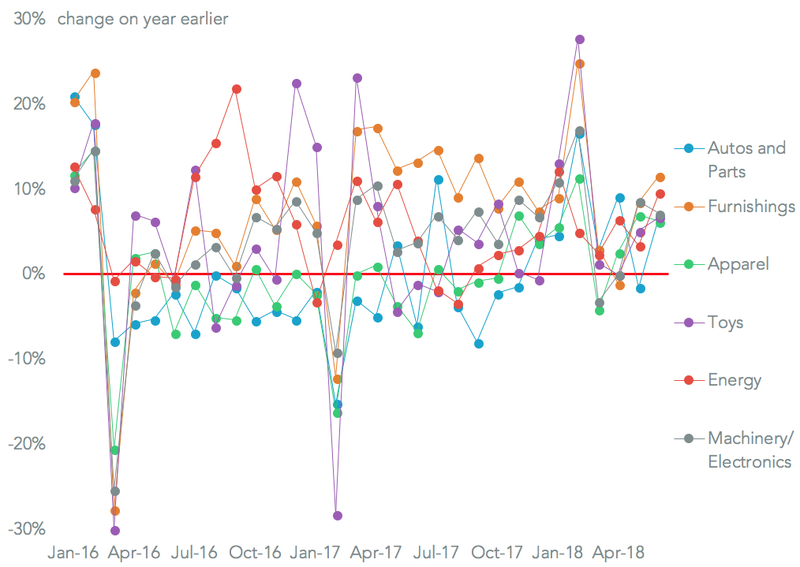 The increase in imports was broad-based with all the major industries tracked by Panjiva increasing vs. a year earlier for the first time since February (which was the result of the timing of the lunar new year). The automotive sector saw a bounce with a 6.8% increase vs. a 1.5% decline the month earlier. That may reflect concerns that the section 232 review of the industry may be delivered before the midterm elections. The steel and aluminum sectors saw a 6.2% rise in shipments, confirming our earlier view that the section 232 duties applied over the past two months have trimmed rather than transformed supply chains. Other major sectors increased by 6% to 7% (including machinery as well as consumer goods such as toys and apparel) while energy jumped 9.6%. While there was a slowdown in growth in the second quarter to 4.8% from 7.1% in the first quarter, total shipments for the year are nonetheless on track for a 5.0% increase before the impact of tariffs. For context China represented 42.1% of shipments by count in the past 12 months. The fundamentals for underlying demand for imports are still strong though with business sentiment towards imports having improved in June. Consumer confidence took a small step back according to S&P Global Market Intelligence but still remains firmly positive.